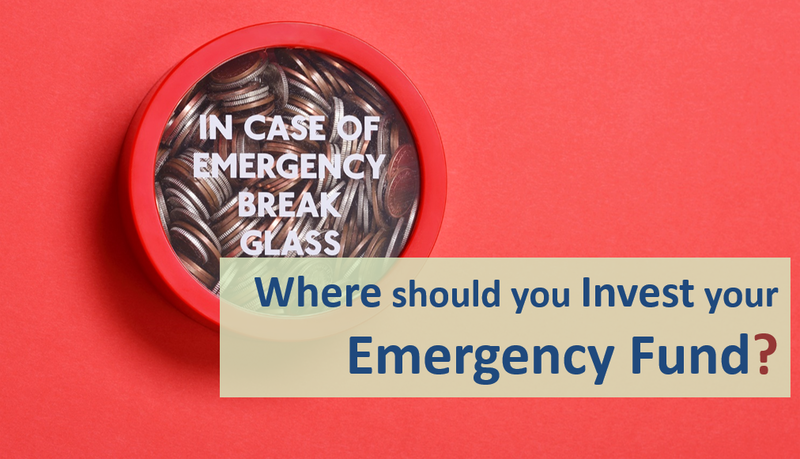 How to Invest your Emergency Fund? We live in an uncertain world and emergencies can arise anytime. It could be due to sudden illness, a car breakdown, an emergency trip, emergency purchase, home/appliances repair, delayed salary or job loss. We need to be prepared for the same at least financially. How much Emergency Fund you need? A person with Government job has more secure job than his private counterpart, so the chances of job loss is lesser and can manage with lower emergency funds. If more than one family member is working, some contingencies are easier to take care. So a working couple can do with a little less in emergency corpus (especially for long term emergencies like job loss). If you have medical insurance, you might not need lot of funds to take care of medical emergencies. If you have good social support systems i.e. borrow from friends/parents/relatives and you do not mind borrowing you might not need huge corpus. Having credit card gives you access to instant credit, so some emergencies like hospitalization, immediate purchase/travel can be taken care with relatively smaller funds. Where to Keep/Invest Emergency Fund? Once you finalize the emergency corpus, the next question is where to keep/invest this. As this corpus is meant for emergency the objective should be easy and quick access, lesser risk and high liquidity. Also you need not keep all amount in one place, it can be spread across multiple options. 1. Cash – You must keep small amount in cash (Rs 5,000 – 10,000) at all times at home/office or while travelling. Though ATMs are now present everywhere but in emergency you would not rush to ATM but rather handle the situation. It would also prove to be a much needed resource in case of any natural calamity. As was the case in recent Chennai floods – almost all ATMs stopped working or were empty of cash. So even though you had money in bank you could not buy anything. Restoring these services takes time and you should have minimum resources to survive until then. 2. Saving Account – This is the default option to park emergency funds. You can withdraw money anytime and it’s easy to operate. The problem is the returns are low – 3.5% for most banks while some offer interest up to 7%. Ensure you have a debit card with adequate cash withdrawal limit. 3. Sweep-in Account – You can use sweep-in accounts to get the same liquidity as savings account but with better returns. In case of sweep-in accounts, automatic fixed deposits are created as soon as the balance in saving account exceeds certain threshold. If you withdraw money which is more than that in savings account, the deposit is automatically broken and credited to savings account. Most banks offer this facility and your excess balance would get interest of 1 year FD tenure. 4. Fixed/Recurring Deposit – if you do not have sweep in account facility or want to take advantage of higher interest rates on certain deposits, you can keep money in fixed deposits. FDs are easy to break in case its online. But in case you do not have online access, a visit to branch may be required. Recurring deposits are especially useful when you are building your emergency corpus. You can do RD of fixed amount, enable auto-debit and accumulate your pre-determined amount with discipline. 5. Current Account linked to loans – there are some loans like SBI Max Gain Home Loan where the Home loan is linked to a current account. While calculating the interest component on payment of EMI, the loan balance amount taken is net of money in current account. So keeping money in current account reduces the interest paid on loan. Therefore, these accounts can be used to park emergency funds. 6. Bank Overdraft against Fixed Deposits –Most banks provide overdraft facility against your fixed deposits. The good thing is the overdraft loan can be up to 90% of the fixed deposit. Also, some banks like SBI has started providing overdraft online. This can be quite helpful in emergency situations. 7. Liquid/Short Term debt funds – this suits people who are comfortable with mutual funds and have online access to invest or redeem these funds. The returns are slightly higher than short term fixed deposits and are more tax efficient if the amount remains invested for more than 3 years. Reliance Mutual Fund also issues free ATM card linked to your liquid fund investment. You can withdraw up to 50% in case of emergency. SIP in these mutual funds can help you disciplined investment to build your emergency corpus. Do not invest in long term or GILT funds as their returns can be volatile and you might have monthly bouts of negative returns especially in rising interest rate cycle. Credit Card – This is the quickest way to borrow and it serves you well at the time of some emergencies. Most hospitals, medical stores, travel agents, car servicing centers accept credit cards. The good part is you get 15 to 50 days to pay the credit card debt and on time payment means no interest charges. However get credit card only if you can handle it as some people tend to overspend and then get into debt trap. Also Read: How good is Credit card against Fixed Deposit? Medical Insurance – In case you have medical insurance most emergencies related to health can be covered. In case of cashless facility you might be able to manage with little funds too. The next question is how to allocate funds among above options. Usually for immediate emergencies like illness, you need money at least to pay for ambulance, doctor and admit the patient in hospital. In case you have insurance/credit card you do not require lot of money in savings account. You can easily keep money in Fixed Deposit/Debt Funds and withdraw in few days to clear the dues. In case you do not have either, you will need to have sufficient amount in savings account. Money for long term emergencies such as job loss can be safely kept in debt funds/fixed deposits and can be withdrawn slowly as required. These are just some cases and you can decide your comfort level with each option. Guiding Principal being easy access at short notice time, returns are secondary. It’s good idea to review your emergency fund requirement at least once every year. It would change with increase of loan liability, inflation or a life event.